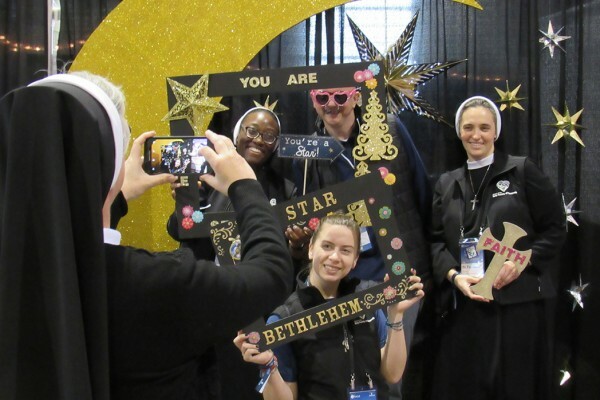 The Sisters of the Holy Family of Nazareth (CSFN) vocation team kicked off 2018 with 8,000 young adults at the week-long FOCUS conference (January 2 – 6) in Chicago. Standing on concrete floors in the large convention center, often late into the night, the team spoke with countless young people, pausing only for a quick moment to sit, grab a sip of water or eat. Throughout the conference, the scene was the same: young women -- alone, in pairs, or sometimes groups -- would approach the CSFN booth with nervous smiles or laughter. With joyful Nazareth hospitality, Sisters would invite the curious onlookers to take a fun picture at the photo booth designed by Sr. Emmanuela Le. “Do you want a nun in your picture?” Sr. Faustina Ferko asked one group. When they indicated that they did want a Sister to join them, she asked, “Tall nun or short nun?” The question resulted in another round of laughter as they chose a “tall nun.” Sr. Faustina, the “tall nun,” put on a pair of plastic glasses and stuck her head in the shot. Many young people who stopped at the booth walked away with similar photos of themselves sharing joy and laughter with CSFNs. Yet, somewhere between the laughter and silly photos, a different type of encounter often occurred. The young women who approached with nervous smiles would soon become more serious, their gazes becoming more intense. They would lean in a little closer, listen more closely. As the Sister spoke with them, their eyes rarely left her face. They seemed almost entranced by the gentle words and loving spirit of a Sister sharing her joy. Many flames were lit throughout the conference as these Catholic student leaders from around the U.S. paused to talk with CSFNs. “It was a good experience and energizing, though I was wiped out,” said Sr. Angela Szczawinska who was among several Sisters from Des Plaines and Mount Prospect, IL who helped at the vocation booth. Others included Srs. Cathy Fedewa, Gabriela Duszynska, Hanna Paradowska, Michaeline Kwit, Teresa Mika, and Trina Marie Ulrich. Sr. Faustina Ferko from Elmhurst, NY and Vocation Ambassador Elizabeth Holman from Texas were also part of the vocation team at the conference with Srs. Emmanuela Le and Josephine Garrett. Among the highlights of the week-long event included a performance by Srs. Emmanuela, Josephine and Faustina (you may watch it here) and an encounter with blessings and autographs from Bishop Robert Barron. Sr. Emmanuela Le, CSFN, National Director of Vocations at vocations@nazarethcsfn.org or visit Become a Sister.